Dreadnought is arguably a much better version of Prototype. Both are essentially horror stories about B’Elanna Torres essentially creating a new mechanical life form, making a decision that has unforeseeable consequences. There is an element of reproductive horror to all this, reinforced by the clever decision to have B’Elanna literally give the eponymous warhead her own voice and watch it engage in a course that is quite literally self-destructive. It is perhaps the quintessential reproductive horror story, the fear that we might create something that will supplant us; that our children become the worst reflections of ourselves. 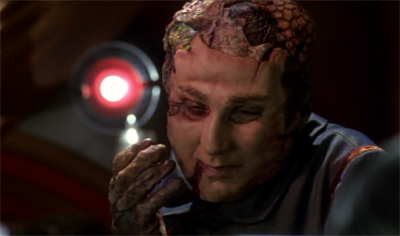 It is interesting that Dreadnought followed Meld so closely; both are essentially stories about how Star Trek: Voyager (and its characters) cannot cleanly escape their past, as much as the show might push it (and them) towards a generic Star Trek template. The middle of the second season sees an emphasis on the idea that Voyager is composed of two radically different crews – that Starfleet and the Maquis are not as integrated as shows like Parallax or Learning Curve might suggest. Alliances, Meld and Dreadnought all build on the idea of underlying tensions that were mostly glossed over during the first season. 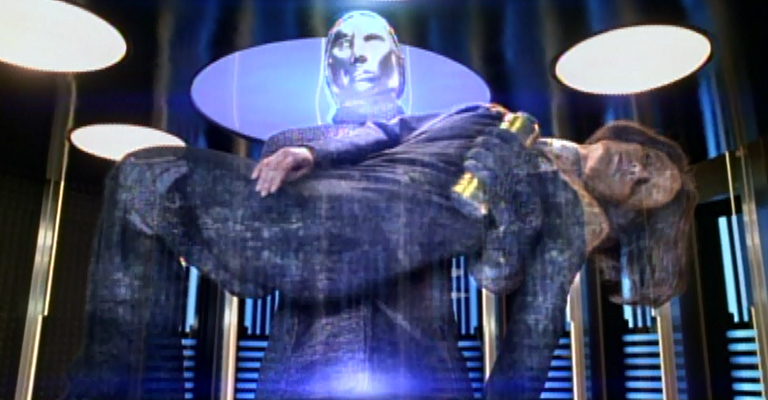 Of course, this creates a weird dissonance, as Voyager seems to actually be moving backwards rather than forwards – attempting a half-hearted do-over of some of its earliest miscalculations. One of the more interesting aspects of the first season of Star Trek: Voyager is just how much of a throwback the show seems to be. In many ways, the show seems anchored in a very fifties mindset. While Star Trek: Deep Space Nine has embraced multiculturalism and the wake of the Cold War, the first season of Star Trek: Voyager seems to be dealing with anxieties carried over from the end of the Second World War. Caretaker reconnected with the “Wild West in outer space” mentality of the classic Star Trek. Episodes like Time and Again and Jetrel are concerned with the splitting of the atom. Cathexis played out a decidedly Cold War paranoia thriller. Good old-fashioned technological espionage – like the leaking of nuclear secrets – was at the heart of State of Flux. There’s a sense that Voyager may have been a piece of fifties Americana that had the misfortune to arrive forty years too late. Faces is perhaps the most obvious example of this. Splitting a bi-racial character into two halves as part of a science experiment, evoking classic monster movies, and even the decision to define the Vidiians as stand-ins for the Nazis, all give the episode a delightfully pulpy feel. This is Voyager doing a cheesy fifties b-movie. And doing it quite well at that. He has you now, his pretty! Parallax feels like a seventh season episode of Star Trek: The Next Generation nested inside a first season episode of Star Trek: Voyager. It’s Brannon Braga’s first script for the show, having opted to join Star Trek: Voyager rather than moving over to Star Trek: Deep Space Nine. Braga would go on to become one of the longest-serving creative forces on televised Star Trek, becoming an executive producer on Star Trek: Voyager and creating (and producing) Star Trek: Enterprise. Braga is a fantastic high-concept science-fiction writer. His scripts for The Next Generation count among the best the show ever produced – Cause and Effect, Parallels, Frame of Mind. The team of Brannon Braga and Ronald D. Moore ranks as one of the most consistently great collaborations in the history of Star Trek. On his own, Braga writes fascinating sci-fi concepts. His scripts for the various shows support that. The problem is that Braga isn’t the franchise’s strongest character writer. Indeed, among the staff writers working on the first season of Voyager, Braga seems like the worst candid to draft in to write the big “establishing character dynamics” episode directly following the pilot. The problem with Parallax is that it’s a nice premise featuring a bunch of characters we don’t care about yet, and the script is more interested in the anomaly of the week than it is in getting us to care about those characters.